The British Horse Society are proud supporters of Brake's Road Safety Week. Their theme for 2018 is ‘Bike Smart’ – which supports the message of our ‘Be nice, say hi’ campaign in collaboration with Cycling UK. Equestrians and cyclists are both vulnerable road users. We both share similar risks when riding on the road, and we need access to more safe off-road riding. 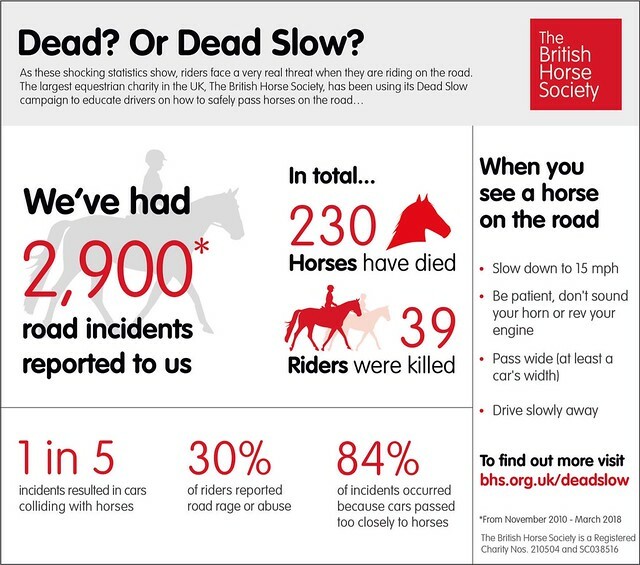 Safety of horses and riders is of paramount importance to us and we want to use Road Safety Week and our Dead Slow campaign as an opportunity to raise awareness of the very real threat that riders and carriage drivers face, and to educate drivers on how to pass horses on the road safely. You can download and share our infographic that shows the shocking incident and accident statistics and highlights the real threat riders face when they are riding on the road. With an increasing number of reported incidents involving riders and cars, we're building on our solid foundation of road safety education and campaigning to make drivers aware of what to do when they encounter horses on the road. We have produced this video to show drivers how to take care and what they need to do when they meet horses on the road. We're on hand to offer some helpful tips and advice for riders to help improve road safety. Read more information about staying safe when riding on the road here. As a Charity, we believe it’s our responsibility to inform riders on what they can do to protect themselves. The TRL conducted research for the BHS to help advise riders on the best way to be seen when riding out. The report, ‘Conspicuity of horses and riders on the road’ was commissioned due to a lack of evidence-based research currently available about what horse riders should wear to help protect themselves. Read the report to find out more information. Ride Safe gives you the confidence to ride in the environments you are most often faced with, keeping you and your horse safe.